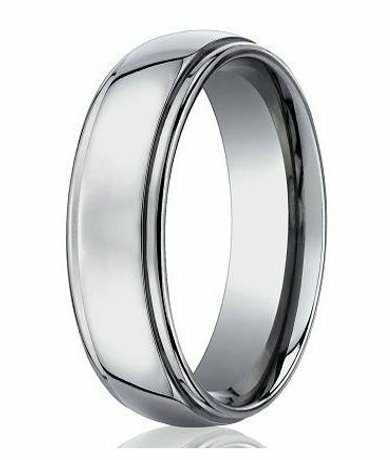 JustMensRings.com takes extraordinary pride in helping couples find wedding rings that they can actually afford, and our 7mm men’s Benchmark titanium wedding band with step-down edges is no exception. This traditional wedding ring features a designer look that is made of aircraft-grade titanium for superior resistance to denting, discoloration, and scratching. Any groom with a classic sense of style can appreciate the timelessness of simple ring design that still speaks volumes. Our men’s Benchmark titanium wedding band with step-down edges is an excellent alternative to rings made of platinum, palladium, or other precious metals. Best of all, this wedding ring is eligible for engraving. Add a special message from your soon-to-be-spouse or your wedding date as a memento of the most magical day. Each 7mm men’s Benchmark titanium wedding band with step-down edges is crafted in the traditional style, which is comfortable to wear and will never fade from fashion. The striking center band features a satin finish that’s stressed by polished step-down edges. Furthermore, the 7mm band isn’t too thin or too wide to distract from your ensemble. Feel and look your best on the big day by choosing the men’s Benchmark titanium wedding band with step-down edges as the ring you’ll wear every day thereafter. If you have any questions about this ring or need help with our engraving services, please contact us today to speak with a representative. Let us know how we can help turn your vision into a reality! My husband is in wind energy as a labor technician and commissioner. He literally had the first wedding band I gave him less than three months before the band was destroyed. The replacement ring I got was a lesser quality because I knew his work would not allow him to keep a ring nice. I recently gave him this ring (my third and hopefully my last wedding band to ever purchase!) as a surprise and he was delighted. It fit perfect and looks sharp regardless of what he finds himself doing. Thank you JustMensRings.com for being our family's solution to the working man's work environment. I purchased this for my husband....so beautiful, great quality, perfect engraving. He says it is comfortable and seems so durable. Definitely would recommend to others!